If your campaign creation efforts and list promotion techniques don’t support these three core principles, you’re definitely not on the right track. Always make sure that each and every text marketing campaign focuses on the following: exclusivity, personalization, and high value. 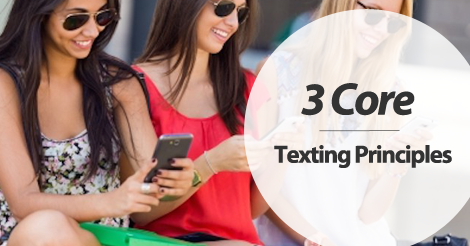 Without these three elements, your text marketing efforts will greatly suffer. Make sure all offers boast exclusivity. Your offers should remain exclusive to your text marketing list. Don’t go firing out duplicate offers to your social media fans or email marketing list. Failure to respect this core principle will result in low offer redemption and high subscriber opt out. If you’re not experiencing text marketing success, you’re easily wasting valuable time and money. Whenever possible, personalize your text marketing communication. We offer the birthday feature for this very reason. We don’t want your subscribers to feel like they’re part of a “generic” campaign. When possible, reward subscribers using advanced segmentation. Fire out high value offers. All offers should be borderline irresistible. You want your subscribers to jump at the chance to redeem. The only way to make this happen? Pay close attention to what your subscribers want. If your offers aren’t in line with their purchasing habits, you won’t experience success. Aside from that, your text marketing campaign composition should be a total breeze. Respect and follow these three core principles. From that point on, it’s definitely smooth sailing. We want to be your text marketing provider. Ready to get started? Give us a ring at 1.800.688.6290 or head over to our pricing page and sign up for a free plan. Our feature rich platform is packed to the brim with educational resources that will help you succeed. Having trouble getting started? Head over to the Text Marketing Learning Center, and sift through the helpful videos, guides, blog posts, and infographics.